North Korean leader Kim Jong-un has called for the military’s contribution to economic development, commemorating the founding anniversary of the nation‘s armed forces this week with a visit to the defense ministry, according to Pyongyang’s state media on Saturday. Delivering a speech at the Ministry of the People‘s Armed Forces on Friday, Kim said the military has “a large share this year, a crucial year in carrying out the five-year strategy for national economic development,” the Korean Central News Agency reported. It was the 71st anniversary of the Korean People’s Army‘s birth. Kim’s visit to the ministry in person came with his second summit with President Donald Trump less than three weeks away. It will be held in Hanoi, Vietnam, from Feb. 27-28, with a focus on concrete measures for denuclearization, an improvement in Pyongyang-Washington relations and lasting peace on the peninsula. 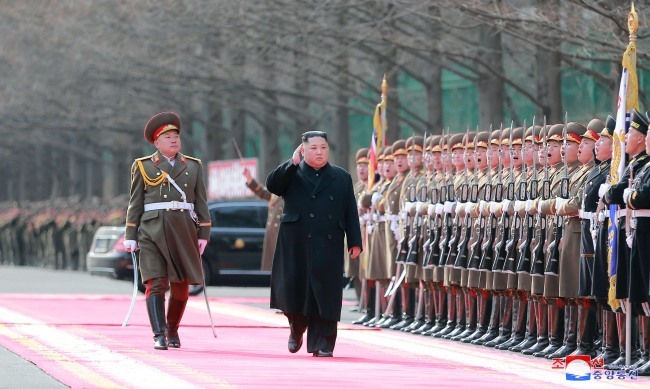 Kim apparently sought to boost the morale of the North‘s troops and strengthen his grip on the military in advance of another meeting with Trump. Kim “extended warm congratulations to the beloved service personnel and their families of the entire army celebrating the significant Day of Army Founding at a stirring time when a new decisive phase has been opened in the development of our revolution and the drive for building a powerful socialist country has been pushed forward on a new stage of development,” the KCNA said in an English-language report. He urged the military to play a role in a “great surge and innovations” in the nation’s “revolutionary struggle” for economic growth and a powerful state. He also attended a banquet, joined by top military commanders and communist party officials, to celebrate the KPA anniversary.